I am pretty happy to read your post. Wow! That is all I have to say after three fun filled days in a world that fed the geek, sparked the competitor, inspired the humanitarian, encouraged the inventor, and continuously warmed the heart in me. First Robotics is an amazing program that strives to inspire young people to get involved with science and technology. To accomplish this goal, they team up young people with engineering minded mentors to create machines with a goal of competing both on the field and by creating team websites. Microsoft is a Crown Supplier as well as a team and regional sponsor for First. 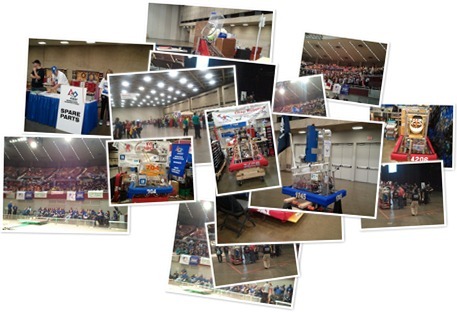 This years Dallas First Robotics Regionals featured two separate playing fields hosting 79 teams averaging approx. 12 students each (between 8 – 20) and 4 – 6 mentors. We had a goal of 150 volunteers per field and managed to get about 120 per field. The volunteer ratio was tight but these are dedicated people and the event was a huge success. This is my third year with First and I was honored enough to serve the Dallas First Regionals as both a Web Site evaluator and as the East Field Volunteer Coordinator. This was also the first year my daughter volunteered with me. My daughter and I both recognize how different the First program is from other team events. The difference with First is that everyone is a first class citizen. Teams have to cooperate as much as they compete. They rely on each other for parts and expertise when things don’t work. Even with a veracious competition, you still find a lot of cooperation and we never witnessed any belittling between teams or individuals. First Robotics coined the term “Gracious Professionalism”. It's a way of doing things that encourages high-quality work, emphasizes the value of others, and respects individuals and the community.1 I was introduced to this term as the Volunteer Coordinator when I was preparing the volunteer instructional speech. Through the next few days, I discovered it is truly core to everything that First does. One of the ways First accomplishes Gracious Professionalism is by utilizing another term they came up with which is “CoopertitionTM”. At FIRST, CoopertitionTM is displaying unqualified kindness and respect in the face of fierce competition.1 One of the things I never liked about sports was the need to “destroy” the other team. First has really found a way to integrate CoopertitionTM into the rules so teams can be competitive and part of that competition rewards cooperation. Oh and did I mention it has ROBOTS!!! This year it had basket ball playing Kinect connected, remote controlled, robots! There are not words for how exciting these games are. You HAVE to check out this years game, Rebound Rumble (also shown above) or you can view live action on Dallas First Video . There are also some images below. As part of the Dallas First Regionals, I was awed by incredible students who teach as much as they learn, inventive and truly caring mentors that make mentoring look easy, and completely passionate and dedicated volunteers that bring meaning to giving all that you have and making events fun and safe for all. If you have any interest in innovation, robotics, or highly motivated students, I can’t recommend anything any higher than visiting a First Robotics event or better yet, get involved. There is always room for more volunteers. Whatever it is, these students get it and exemplify it and these mentors ooze with it. I am glad that First supports these events so we can all learn and be inspired by these exceptional students and mentors. I know that no matter how much I give, it will never compare to what I gain volunteering at First. Even if you don’t have time to volunteer, you owe it to yourself to go check out one of these events. See what the future holds, be inspired, be encouraged, take some knowledge, leave some knowledge and most of all, have FUN. That is what First is all about and thanks to First, I get it.